Baby Foodie is One Handed Cooks’ first e-Book. Newly updated in 2016, to coincide with the launch of Finger Foodie (think BLW, toddlers, fussy eating), Baby Foodie is your must-have starting solids guide, taking you and your baby from first tastes, to finger food and everything in between. 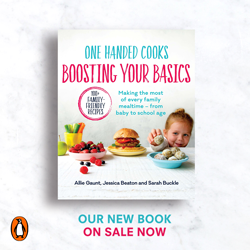 With over 60 dietitian approved recipes for you to try, nutrition notes and fussy eating tips to help along the way, your baby will enjoy a positive and nutritious start to their food journey. 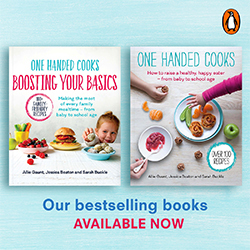 If a hard copy book is what you’re after, our new cookbook One Handed Cooks – Raising a good eater from baby to school age is now on sale. It takes you on a feeding journey, from starting solids, to finger foods, healthy snack ideas and introducing family foods. Why you will love the book? Encouraging your children to develop a happy and healthy relationship with food can make a huge difference to their mood, growth, development, lifestyle and future wellbeing. Baby Foodie encourages you and your baby to start the solid food journey in a positively and nutritionally balanced way. The “Raising A Good Eater” guide will help you navigate through any fussy eating phases and help establish good food habits right from the start. Prevention is always better than cure. Each chapter allows for you to go at your own pace, incorporating texture and finger foods early to promote chewing and using natural flavours to ensure a smooth transition to family foods. The e-book is a PDF which can be viewed on any computer, iPad, iPhone, smartphone or tablet with a PDF view. I tried to purchase your ebook but it directed me to a blank page. help please? Hi I purchased by baby Ebook by PayPal last night and have not received an email with link? The paypal payment was under Michael Vance or Amie Hewett. Can you please help? Hi, I purchased this book last night through PayPal and I’m yet to receive the email. Can you please send me the link? Can u get the baby foodie in hard copy or is it only as an e book? Can u buy this in hard copy? Hi, I would like to purchase the book but just wondering if it’s suitable for a 13 month old baby.